The most dynamic business limousine by Mercedes-Benz is the E 63 AMG. The company AMG which is located in Affalterbach skilfully combines 525 hp (386 kW) with very luxurious interior equipment. But for Carlsson this was neither dynamic nor luxurious enough. The automobile manufacturer from Merzig / Saarland presents the new E-CK63 RS based on the E 63 AMG and thereby discloses the technical possibilities. The core part of the refinement is the entirely re-engineered V8-engine. The Carlsson engineers accomplished to boost the performance from 525 hp (386 kW) to impressive 585 hp (430 kW) without changing the cubic capacity of 6.3 liters. Also, the Mercedes specialists from Merzig increase the maximum torque from 630 to 695 Newton metres. With a perfected motor management, an optimised exhaust system and most accurate adjustments, the E-class top model by Carlsson accelerates from zero to 100 km/h in only 4.5 seconds. This is three tenths of a second less than the acceleration values of the E 63 AMG. The revolutionary refinement of the E 63 AMG also shows in the new wheel design. With the Carlsson wheel 1/5 REVO in 8.5 and 10.5×20 inches, the automobile manufacturer fits a trend-setting, one-piece light alloy wheel. The wheel has five double spokes, one is painted in matt black and the others sparkle with a high-gloss polished surface and are aimed at the self-confident driver. The refinement of the strongest E-class is perfected with the interior. 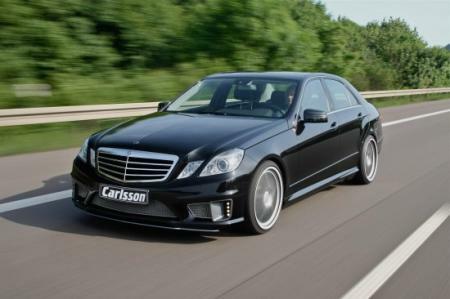 There, Carlsson uses leather and ultrasuede and therefore creates an enormously luxurious atmosphere. Not only the seats, but also the steering wheel, the automatic gearstick and the insides of the doors are lined with the most delicate materials. Carlsson sets highlights with aluminium applications such as the door lock studs, the pedals and the foot rest. Another eye-catcher are the illuminated floor mats with an embedded, white illuminated Carlsson logo.